An Emory University study from last year suggests that reading fiction can enhance the neural connectivity in your brain, though it’s not clear how long the impact lasts. Empathy, apparently, can be understood biologically, not merely in a figurative sense. So, as the summer holidays begin, what better reason is there to read fiction, apart from the pleasure it provides? Among many new novels, we can include Pia Padukone’s debut, Where Earth Meets Water (Harlequin), a Barnes and Noble featured title. Was the protagonist Karom Sheth’s lucky escape from two tragedies—9/11 and the 2004 tsunami—a blessing or a curse? Next, Jerry Pinto’s novel, Em and the Big Hoom, winner of The Hindu Literary Prize in 2012, is being released by Penguin. Another debut novel is from Bangladesh-born Zia Haider Rahman, who has worked as a human rights lawyer and an investment banker on Wall Street. His widely praised In the Light of What We Know (Farrar, Straus and Giroux) tells the story of two men—one with roots in Pakistan, the other in Bangladesh. Then there is The City Son (Soho Press), a new novel from Nepal-born Samrat Upadhyay. In this dark love story, the attention a disregarded wife lavishes on her husband’s illegitimate son has profound consequences. And if you’re heading to the beach, how about picking up A.X. Ahmad’s fast-paced thriller? 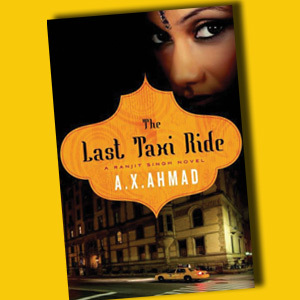 He brings back his hero Ranjit Singh, who is now a New York cabbie in the noirish The Last Taxi Ride (Minotaur).